Buster Posey crouched behind the plate through a parade of relievers in a long, long inning. A little exhausted, the San Francisco catcher had the perfect way to save some energy when he batted in the eighth - hit the ball deep and jog around the bases. 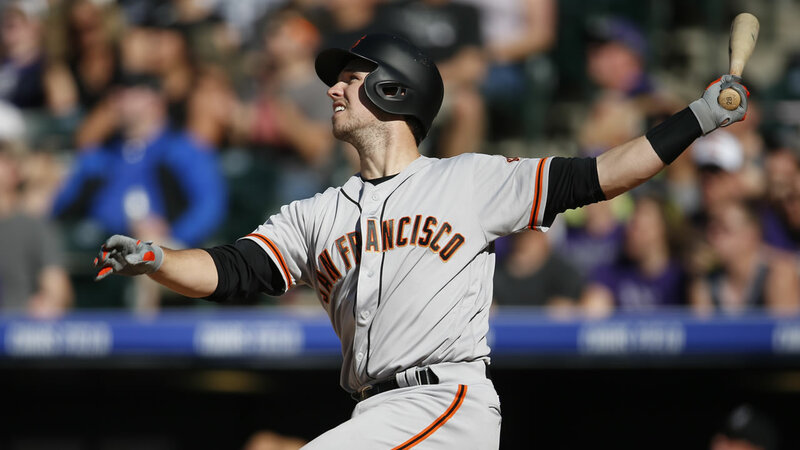 Posey hit a pair of three-run homers, including a tiebreaking drive as part of a six-run eighth inning, and the Giants rallied for a 10-5 win over the Colorado Rockies on Saturday. Another wild one at Coors Field in a game that featured both bullpens blowing late leads, with a combined 11 relievers being used, and lots of late scoring. "You figure you're going to have some back-and-forth games, some long games here," Posey said. The Rockies were limited to one run over six innings by starter Madison Bumgarner, but erupted in the seventh against five San Francisco relievers to take a 5-4 advantage. San Francisco responded right back with six runs in the eighth. Posey led the charge with a towering homer to right-center off Carlos Estevez (1-2). Posey also hit a three-run homer in the first inning. It was the third multihomer gamer of Posey's career, two of which have now come against the Rockies. His six RBIs tied a career best. The fact he hit both of his homers to right-center was even more encouraging. "I'm happy with driving the ball that way. This is a park that allows you to do that," Posey said. "Sometimes at home, those balls are tracked down in the gap." Cory Gearrin (1-0) threw 1 1-3 scoreless innings to earn his first win since May 28, 2013. He also had his first major league hit. "We needed somebody to calm things down. He did a great job," manager Bruce Bochy said. Bumgarner was at his best in the sixth inning when he escaped a bases loaded, no-out jam by striking out Ryan Raburn and getting Cristhian Adames to hit into a double play. That kept a 4-1 lead in tact. "I can't say enough about what Bum did today. What a gutty effort," Bochy said. "He willed his way through that sixth inning. What a jam he was in." Only, the bullpen couldn't hold the lead. Nolan Arenado had a two-out, two-run double in the seventh and Carlos Gonzalez followed with a towering, two-run homer to center that gave the Rockies a 5-4 lead and sent the more than 39,000 fans in attendance into a frenzy. That was soon silenced as the Rockies bullpen couldn't make the lead hold up, either. Estevez gave up singles to Joe Panik and Matt Duffy before Posey delivered a three-run shot. "You have to have a short memory," Estevez said, who only faced three batters and didn't record an out. "You fail and tomorrow you may get a chance again and you have to be ready for your team." Jarrett Parker also chipped in an RBI single in the eighth and Gregor Blanco added a two-run single. In all, the Giants sent 10 batters to the plate in the pivotal inning and had eight hits. "It's exciting to come from behind, and Buster to have a huge day," Gearrin said. "It was a good win."